WILLEMSTAD - The embattled local aviation company InselAir conducted a test flight with an MD jet yesterday. On board of the aircraft were pilots, InselAir technicians and inspectors of the Curaçao Civil Aviation Authority (CCAA). The test flight went well but some issues were discovered that have to do with the fact that the aircraft was on the ground for a while. InselAir, which has a new interim management since February this year, is optimistic and hopes to be able to operate routes to other destinations like Paramaribo, Georgetown and Santo Domingo per October 1. 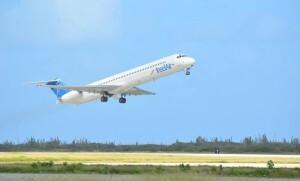 The management also wants to use the MD as soon as possible on the Sint Maarten route. In the middle of November, the management will announce further expansion of the route network.